This has proved to be my biggest challenge so far simply because of the endless possibilities available within the theme. I spent six weeks trying out a number of ideas and designs and they all seemed to me to be bigger than the format allowed. Eventually I decided to scale down my plans and opted to use a close up photograph I had taken in my front garden in England. I have always loved these poppies and have taken several photos over the years. The piece’s title has a double meaning. My garden has always been a haven for birds and I have done everything I can to encourage them. Hence the small birds on the lawn in the background. The poppies are also visitors. The seeds were never planted but have obviously arrived as nature planned. They are perennials and are now established and return each year in the early summer and are indeed most welcome visitors. Again I appear to have made a pictorial piece which was not my original intention. It is made, with the exception of the seed head tops of hand dyed fabrics from my stash. 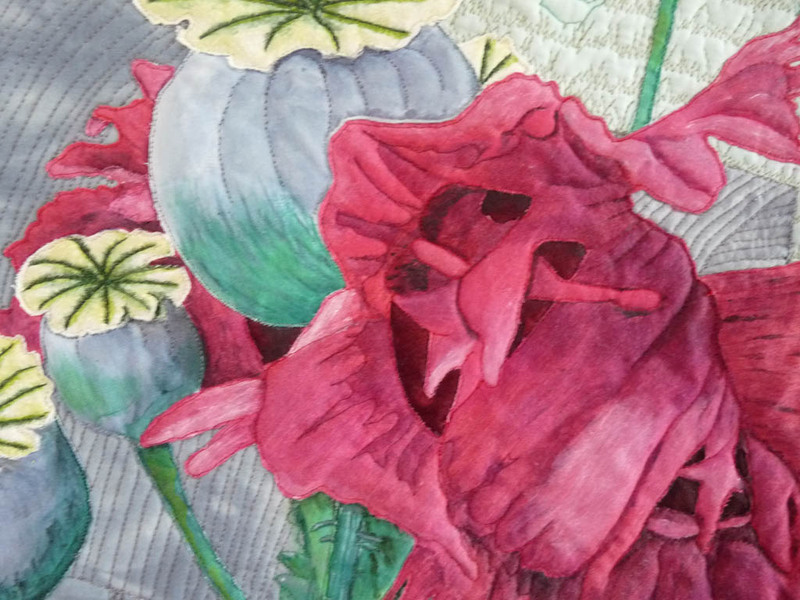 The red fabric base used for the poppy was dyed specifically for the project. 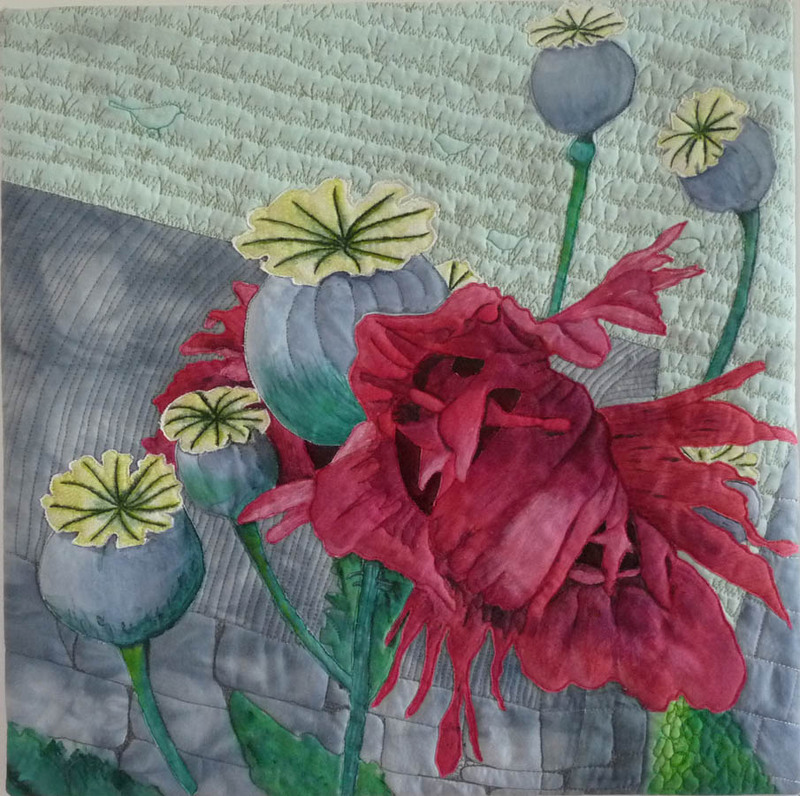 The poppy, seeds heads & stems are raw edged applique over painted with fabric paint. The leaves in the foreground are simply fabric painted. 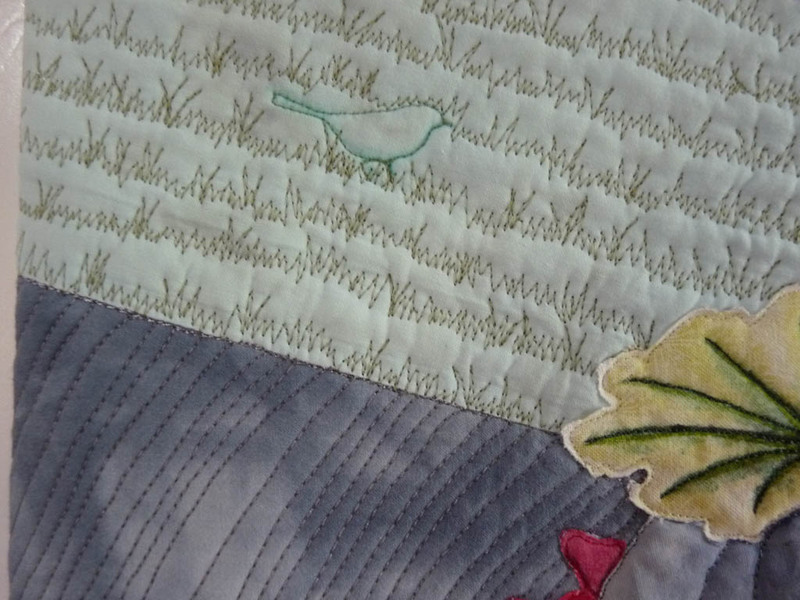 Free motion quilting / thread painting has been used to complete the piece, which has been finished with a facing. I am really pleased with the final result and feel it is my best to date. You always put so much thought into your work and yea that id half the fun to see what you have picked to work on and how you approach it ….I thing I am fan of your work.